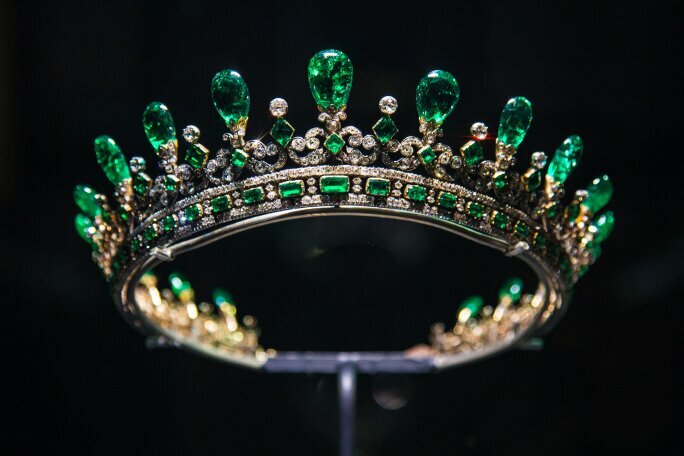 Originally in the private collection of Queen Victoria, this superb emerald and diamond tiara, which features in the Victoria Revealed exhibition at Kensington Palace, is a truly unique survival from the Victorian era. 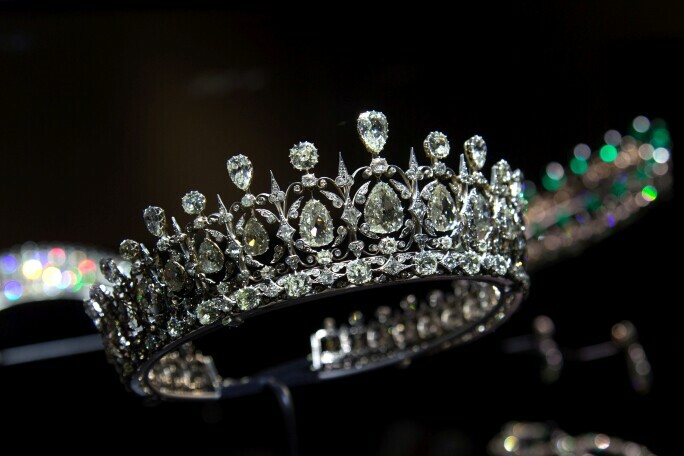 The tiara was designed by Prince Albert for Queen Victoria and made by the Queen’s jeweler Joseph Kitching in 1845. It is now part of a group of jewels from the collection of the Duke of Fife that has been loaned thanks to arrangements negotiated by Sotheby's Tax, Heritage & UK Museums department. Queen Victoria and Prince Albert had a great interest in each other’s clothes, and even before their marriage Prince Albert had shown a particular inclination towards jewellery design. The following year the couple focused on an emerald parure supplied in part by Kitching and in 1845 the firm produced an emerald tiara of Gothic inspiration. The Gothic theme may in part have been inspired by the Plantagenet Ball held at Buckingham Palace on 12 May 1842 where all the guests wore costumes inspired by Medieval England with Queen Victoria as Queen Philippa of Hainault and Prince Albert as Edward III. 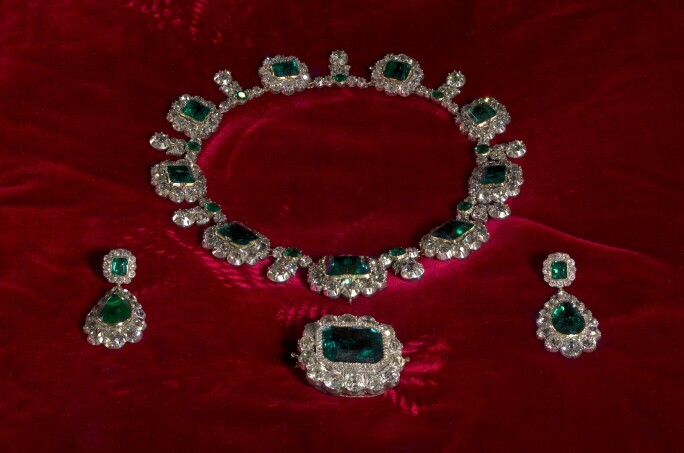 In tribute to her husband the Queen also decided to wear her entire emerald and diamond parure in July 1847 at a banquet at Trinity College, Cambridge, celebrating Prince Albert’s installation as Chancellor. The Fife tiara is equally magnificent and set with an excess of 200 carats of diamonds, which would not have been possible prior to the discovery of diamonds in South Africa in the 1860s. The piece utilises an innovative design by the famous Paris jeweller Oscar Massin, who pioneered the use of concealed settings. Mounting the diamonds on knife edge bars the setting is nearly completely concealed giving the illusion that the diamonds almost float. A wedding present from the Duke of Fife on the occasion of his marriage to Princess Louise, granddaughter to Queen Victoria, it is a rare survival from the period as so many jewels from this date were later dismantled due to changing fashions and their high intrinsic worth. The Fife tiara has been accepted in lieu of Inheritance Tax and allocated permanently to Historic Royal Palaces for display at Kensington Palace. The Victoria Revealed exhibition is on view at Kensington Palace from 30 March 2018 through 16 January 2020.